Via The Points Guy, the Chase United MileagePlus Club card, which comes with lounge access, is raising the annual fee from $395 to $450. For now, the annual fee is still $395, so you may want to sign-up soon and take a screen shot of the lower annual fee before it changes. The higher $450 annual fee is the same as other cards that also offer lounge access like the Citi AAdvantage Executive World Elite Mastercard and the Citi Prestige Card. The cost of annual lounge membership is also increasing from $500 to $550. These changes may be because United Airlines has plans to renovate current lounges, add new lounges, and upgrade the food. Emily and I don’t earn a commission on this card, but we’ll always tell you about the best offers. Head for Points reports, IHG has 2 ways you can save on its hotels in Europe this summer. (You must use the links on the landing page to book). IHG hotels include Candlewood Suites, Crowne Plaza, Holiday Inn, Holiday Inn Express, Hotel Indigo, Intercontinental Hotels & Resorts, and Staybridge Suites brand hotels. 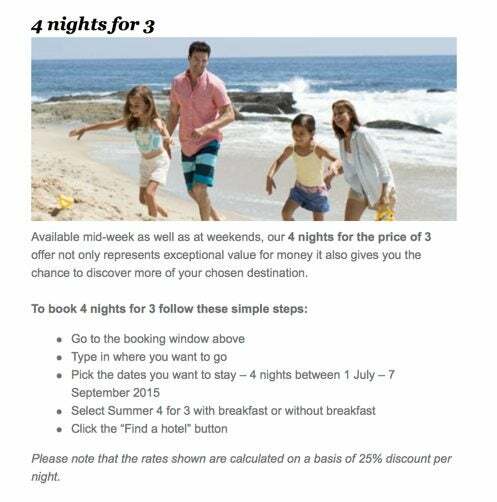 You’ll get the discount when you book before August 23, 2015 (using this link) for travel from July 1, 2015, to September 7, 2015. These deals are only good for IHG Rewards Club members. So if you don’t already have an account, it’s free and easy to sign-up. But blackout dates may apply at certain hotels. And some folks are having difficulty finding dates that work with these discounts. When you book exactly 4 nights (weekdays or weekends) at participating hotels in Europe you’ll get 25% off each night. If you plan to stay longer than 4 nights you can book the extra nights separately. Holiday Inn Express hotels in the UK and Ireland are excluded. 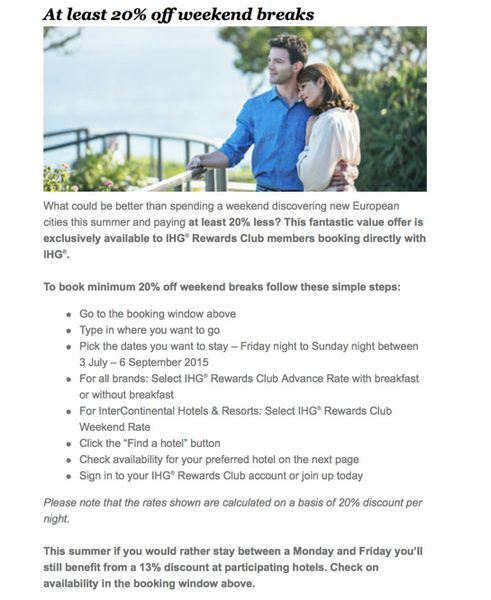 When you stay at participating IHG hotels in Europe from Friday to Sunday nights you can save 20%. And if you stay Monday through Thursday nights, you’ll save 13%. Loyalty Traveler writes, members of the US military can save at Disneyland and Disney World with the Park Hopper Ticket. Military members can visit both Disneyland and the California Adventure Park with the 3 Day Park Hopper ticket, which costs ~$132 (or $44 per day). Purchase your tickets by October 1, 2015, to get the discount for any 3 days through October 3, 2015. There’s also a military discount on the 4 Day Park Hopper ticket. With this ticket you can visit Disney World, Epcot, Disney’s Hollywood Studios, and Disney’s Animal Kingdom park for ~$177 (~$44 per day). To get the discount, purchase your tickets by September 30, 2015, and select any 4 dates through October 3, 2015. This is an amazing discount! If you purchased the same ticket directly from Disney, you’d pay $393! And on discount sites like Undercover Tourist, you’ll pay ~$365. Active and retired military along with National Guard and US Coast Guard members or their spouses are eligible. Also, check out my posts on how you can save money on airfare to Orlando and during your time at Disney World. When you book your next hotel stay through Rocketmiles you can earn 1,000 to 5,000 Southwest points per night (using this link). Or, if you’ve never used Rocketmiles you can earn 3,000 bonus Southwest points when you sign-up and make your 1st reservation. And earn an additional 1,000 to 5,000 Southwest points for your stay. Check out my post on how Rocketmiles works. Book by August 31, 2015, at 11:59 pm Central Time to earn the bonus points. I’ve written about this deal before, but this is a reminder for folks who have summer travel plans. When you complete 2 stays at Choice hotels you can earn 5,000 to 8,000 bonus Choice points (depending on the number of base points you earn). And Choice hotel award nights start at 6,000 points per night. The 8,000 Choice Hotel Points You’ll Earn From Completing 2 Stays Is Enough for a $50 Gift Card From Certain Retailers. Or You Can Redeem the Points Any Way You Like! There is NO limit to the number of points you can earn from this promotion. If you book a paid stay, you can earn 8% cash back at Choice Hotels with TopCashBack. And you may be able to combine it with your AAA number for an added discount. I like to transfer Choice Hotel points to Southwest because they count towards the Southwest Companion Pass. 6,000 Choice Hotel points will give you 1,800 Southwest points.